As Hurricane Florence begins cutting into the eastern United States, Medical Teams International is poised to respond. More than one million Americans have been told to leave their homes and evacuate to temporary shelters capable of weathering the high winds and pummeling rains. These shelters are far removed from storm surges and flooding. Nonetheless, families are leaving everything behind to seek safety from what could be one of the strongest storms to hit the Eastern Seaboard in decades. Your help is critical at this time of need. We are working with a trusted partner to help deliver critical supplies to families impacted by the storm. Our partner, MAP International, is located in Georgia, close to where the storm has started to make landfall. We are supporting efforts to deliver supplies to the families affected. Just $10 will build and distribute a Disaster Response Kit. Your generous gift will go to this domestic response effort and help a family in need. The Disaster Response Kits include necessities like antiseptic wipes, soap, toothbrushes, toothpaste and more. These are vital to prevent the spread of illnesses in shelters and to help families maintain their hygiene and dignity. The strong Category 2 storm is expected to push through the Eastern Seaboard this evening and into Friday morning. The Carolinas are already expected to bear the brunt of the storm. 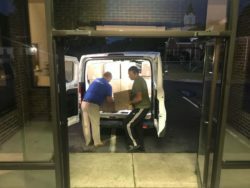 When a series of storms struck the United States last year, Medical Teams International worked with MAP International to deliver supplies-filled Disaster Health Kits to families who had nothing. With storm season upon us again, we’re called on to assist in these efforts once more. Partner MAP International load supplies bound for storm-affected families. As we saw with last year’s storms, high winds, heavy winds and storm surges can have a devastating impact on American communities. Take action now to help a family. With a simple gift, you can bring important supplies to people in need close to home.